Your biggest dream as a hobbyist making games is that one of your projects truly explodes. Over the last years we see more and more people trying to throw their ideas into the world and only a few of them are actually nice ideas. As we have seen with big names like Minecraft and DayZ , that even the Alpha state of a game can be a huge success and get a lot of people’s attention. Cube World is another one that can add itself on this list, the past week they have really experienced what a luxury problem might be. Cube World, a game that was made by a hobbyist named Wollay, was begun 2 years ago as a simple experiment. Being a big fan of Minecraft, Zelda, Diablo, World of Warcraft and some other big names, he decided to make a mixture of what he felt made each title so successful; something that was infinite, colorful, full of adventures, and with plenty of monsters and mysteries to discover. 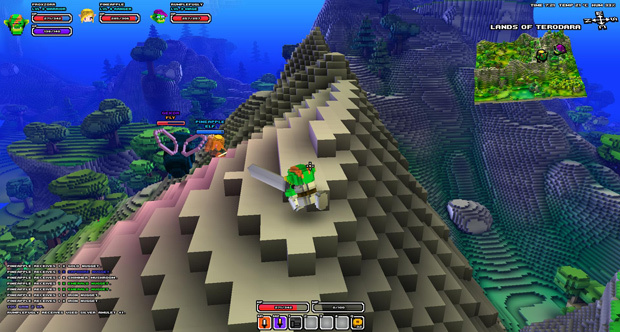 As a result comes Cube World, a voxel-based role-playing game. As the name suggests, everything is made out of cubes including your character, the world, and the various creatures you’ll stumble across. Before I want to talk about the game however, I want to talk about the first world problems of a successful project. Last week when Cube World decided to open its door to the public, for only a small price of fifteen euros, the site received a huge influx of interested people, or as I would like to call it, a friendly DDOS. Because of the huge influx, it didn’t really take long for the website to crash and the team behind this game had to take the registrations and option to buy the game down. Over the course of a few days, it was turned on and off hoping that the inflow of people would stabilize, but unfortunately up until this day it is still being turned on in phases because of the friendly DDOS. People really want to play this game. Despite the Alpha label being in place to scare off the kids with no intention of doing actual testing and bug reporting, the sheer uniqueness and massive features list just keeps drawing in more players by the day. Patience is something this community is likely not going to have pushing forward. I suppose we’re in no way guilty of this as a quarter of our team’s writing staff and RPG fans from around the world managed to squeeze into the packed servers this weekend to test things out. The day the doors were opened, our forum chatbox lit up with our community members joining together for the adventure. Luckily we were the prepared ones that got in before the endless series of crashes. Since the game is still in Alpha, there isn’t that much to do yet, but what was there felt solid and polished. First off I have to disagree with Wollay, Cube World is too different to easily compare it to anything that came before it. Sure it is inspired by these past titles, but the overarching vision is all Wollay. Visualize yourself in a Minecraft world, made out of blocks and squared objectives. Now completely think away all the crafting, and throw in a hundred different monster varieties in various locales around the world. 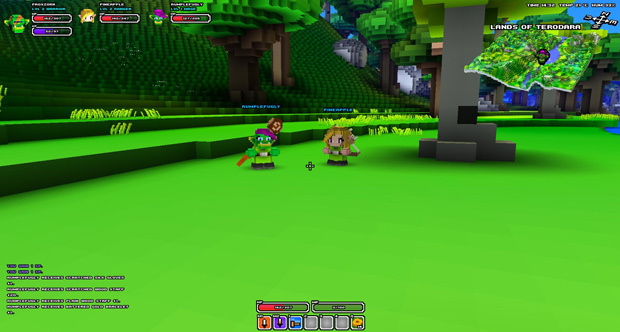 Starting with the character creation, Cube World already demonstrates it has plenty to offer. There are currently only the four standard classes we have seen in many games before which are the Warrior, Rangers, Mages and Rogues. Currently each one of these classes has two branches they can pursue, though it’s more of a barebones layout of future plans than fully fleshed out character designs. There’s just enough finished to make you stop and notice that you’re playing a rogue instead of a warrior during the gameplay. In addition to classes there are eighth races ranging the gamut from frogmen to undead skeletons. Each has a well-designed artstyle, quite a feat given the limitations of the blocky graphics. But Wollay promises plenty more classes, advanced specialization options, additional races, and more complicated skill trees for all classes at launch. Now perhaps it’s Cube World’s artstyle, but the one title it’s hard to ignore while talking about the game is Minecraft. Yes I know Cube World is a completely different genre of game, but blocks look like blocks. 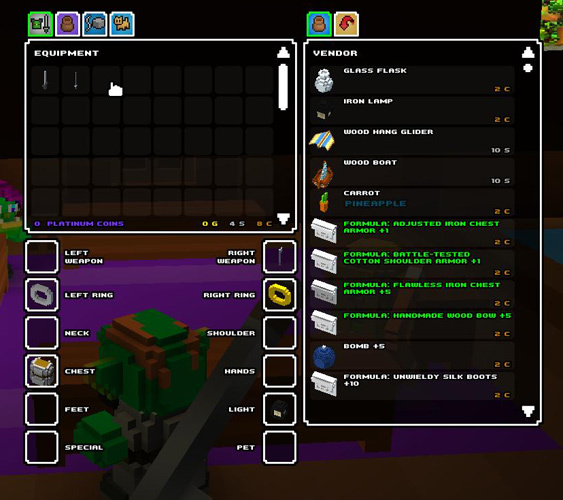 The control scheme as well has a distinctly Minecraft feel with slight variations to adjust to a wider array of gameplay modes. 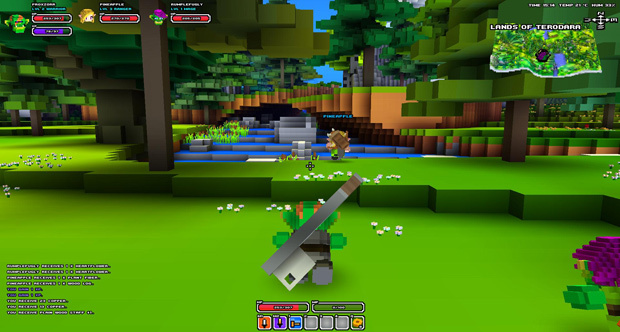 Instead of playing in first person (which is available as an option if you prefer), Cube World offers a much smoother third person experience that is a lot easier on the eyes. With a small crosshair on the map, controlling your character is a very easy thing to do and I hope a lot more RPGs and even MMOs take this same route. Aiming attacks is necessary and missing is possible. As you can imagine, I couldn’t resist starting my trial as a frog. What is not to like from these adorable little creatures? The character options let me adjust his eyes and mouth to be the most handsome prince among frogs the kingdom had ever seen before I finally confirmed my name and set off to adventure. Now the gameplay itself can be best compared to the random infinite world generation of Minecraft mashed together with a Diablo dungeon crawling system. The further you journey from home, the nastier the monsters you’ll find waiting for you. The world is big… really big. As a level one, you can only battle the most harmless looking of creatures including bunnies and flies. In your weak state the world will seem unforgiving, with almost any exploration attempt ending in your untimely death. Yet the draw to find out what’s out there will lure any self-respecting adventurer into this unavoidable death as the urge to see what is out there is just too strong to resist! All over the world you can find plants and objects that you can pick up or attack to collect crafting materials. The crafting is currently in place in-game but don’t expect it to be on par with Minecraft’s crafting at this stage in development. You can however build your own gear, equipment, and a few miscellaneous supplies. Honestly I can rattle on about Cube World for hours, and it is no wonder why the game’s popularity has exploded this year. The project claiming to simply be a combination of gameplay elements from inspiring titles is quickly establishing itself as a leader in innovative gameplay all to its own. I have played together with many friends, clearing dungeons, killing huge bosses and swimming under water just fooling around. And that’s what I feel one-ups the current MMORPGs on the market. You can have so much fun in this game while accomplishing nothing. The reward is the gameplay itself. No dangling carrot or promise of power is needed to force you through uninspired grinds and pointless quests. Even though the game is in its Alpha phase, I can say this is one of the most promising alpha phases I’ve encountered. The sheer number of ways you can kill time in it is phenomenal and looking to expand exponentially based on Wollay’s promises. Just be ready for more friendly DDOS attacks as I don’t think this tiny indie project had any inkling of the impact it was set to have on our industry. como eu jogo o CUBE WORALD sem abaixar ?